Posted on September 5, 2017 at 9:15 am. 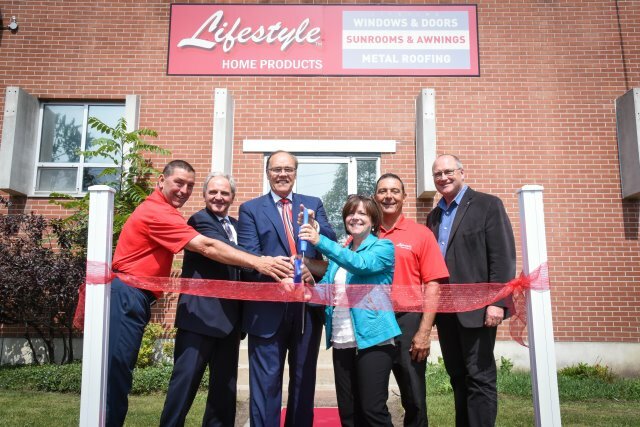 On August 25, 2017, Lifestyle Home Products cut the ribbon at their new 150,000 square foot factory and showroom in Peterborough, Ontario. Although Lifestyle has been manufacturing at this location for the past three years, the company, formerly headquartered in Ajax, is now proud to serve Peterborough and the Kawarthas from its new factory-direct showroom. In attendance at the event were local news media and dignitaries, including Otonabee Ward Councillors Lesley Parnell and Dan McWilliams, Brock Mission Executive Director Bill McNabb, and Peterborough Mayor Daryl Bennett. The Lifestyle team served up a barbecue lunch and guided tours of the factory. In addition to employing 150 people at the Peterborough facility, Lifestyle Home Products proudly contributes to community causes. As part of the ribbon cutting ceremony, Lifestyle owners Bill and Keith Carroll presented the Brock Mission with a cheque for $2,000 to help with fundraising towards the mission’s new men’s shelter in Peterborough. Operating since 1989, Lifestyle Home Products is Canada’s leading manufacture of custom high-efficiency (EnergyStar) windows, high-security doors, three- and four-season sunrooms, and lifetime metal roofing. Lifestyle’s installers work year-round to provide fast and efficient installations of the best products on the market to homeowners and businesses across Ontario, from Peterborough through the GTA to Hamilton and Kitchener.